My clams are alive and well inside a cooler in my garage with an aerator bubbling away. I changed the water in the cooler yesterday with a fresh bucket (5 gal) from the river. Today I noticed a bunch particles that I could only describe as clam crap inside the cooler. I assume they are going through some detoxification process similar to what I am going through. I have never kept clams alive for an extended period of time like this so I'm curious how this is going to affect their overall taste. The last time I ate them I was left with a 'river bottom stink' in my palate and I am hoping that this long filtration process will change all that. I plan to change the water out every few days so I will probably get some indication about how clean they are based on the debris in the water each time I change it. Another interesting SDC experiment. It was a beautiful day today and I spent most of it outside fiddling with the new smoker. After a soak in brine, the trout fillets were ready to be dried. I have a fan dehydrator in the garage and this process took a couple hours. 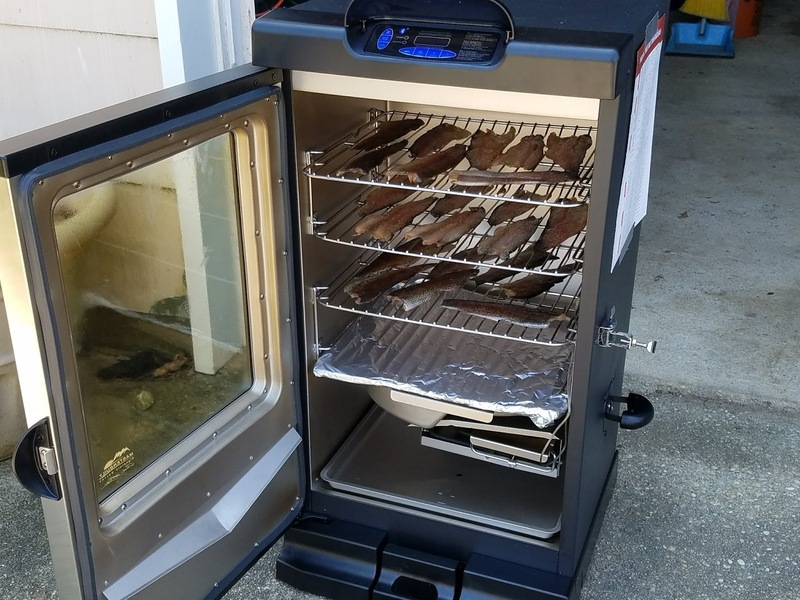 While the fish was drying I did some finishing touches on the new smoker and then ran it through a cycle in order to make sure I knew how to work it properly. When the fish was dry, I added the pieces to the racks in the smoker and let it run for about two hours. This new piece of equipment is fantastic compared to the way I used to smoke fish. I know a lot of you are probably thinking that this isn't true surviving - using a high tech digital smoking grill to do the work. I have to agree with you. You're right. But I am learning from this and with the information I get I should be able to make a fully operational natural smoker. In the past I was using way too many wood chips and I also was not curing my fish properly. There are may ways to do it so it is really up to your personal preference and how you like your smoked meats. In the end, the finished product was a success with a slight failure. Once again I used too much salt in the brine process. This resulted in an overly salty jerky. The smoker worked perfectly and was a breeze to start up and to clean and store. It has given me many ideas for future use. As for my salty trout. . . I wasn't that bad so it's definitely edible. I brushed on some honey for the last half hour of smoking to give it a nice glaze and slight sweetness. I can handle the extra salty flavor for this batch and I'm not about to let 11 trout go to waste. Now I just need to catch some more. I can probably live off of this supply for a few days without a problem. Speaking of problems, I have a Survivor Diet dilemma in the form of a slightly 'Special Occasion' that came up today. A group of my family members went to a P!ink concert and everyone met out for dinner at a restaurant before the event. I had a difficult time with this despite everyone knowing I was doing the SDC. I could have kept to the diet but in all honesty I did not. Instead I had a moderate amount of real food and I didn't feel guilty about it until this moment while I type this log. This is a good reason to keep a log because it forces me to be held accountable for my actions. 1) I could do nothing and just blow it off as a momentary lapse of judgement - and then move on. 2) I could invoke a "Special Occasion Reward" as set forth in the SDC Official Rules and Guidelines (see link above). In this case I would need to 'trade' my indulgences from this evening for one of my upcoming Weekly Rewards. Here's what I ate so that you, the reader, can get some idea about the severity of this violation: Red wine (about 2 glasses), small bite of Italian bread dipped in olive oil (it was just a taste that I really didn't even enjoy), tomato and sliced mozzarella salad, foie gras (one slice), broccoli rabe and a couple small taster bites from other people's plates such as a bite of beef carpaccio, chicken, lamb, and pollenta. I was mindful about trying to moderate the quantities of food. I ordered things that were in the realm of Survivor Diet food stuff. And I also paid a pretty harsh price in my bathroom when I got home later that evening if you know what I mean. For a week my body has been purged of unnatural ingredients and although what I ate was not extremely rich or saucy, there were some things that my stomach was just not ready for. Here's what I'm prepared to do. I am going to go with option #1 above for now because I feel as if I paid a pretty bad price already due to the stomach pangs and diarrhoea. However, if I get a minimum of 10 viewers out there in the world who vote on option #2 within the next week, then I will abide by that decision and go with the Special Occasion Reward exchange option. Leave your opinion in the comments section below. If anyone has another option I'd be willing to listen as well. So there you have it. I'm leaving my fate up to the readers and I am in a sense trying to get a feel if there are many/any people out there that are actually following me or reading any of this. If nobody really cares what I do then I might as well just chalk this one up to a momentary lack of will-power, an move on the best way that I know how. I've always suspected that I'm going through the motions and doing all of this just for myself anyway but there was always an inkling of hope that my SDC would spread and my messages would be heard. Even if only for entertainment value. We'll see. . .
You should have to do a 24hr fast as punishment! You cheated yourself and your followers. 24hrs No Food! I could do that. You need 10 votes to pass. . .? anyone?